One of the first questions readers ask is what was the inspiration for your book. Priya in Heels was inspired by my life. 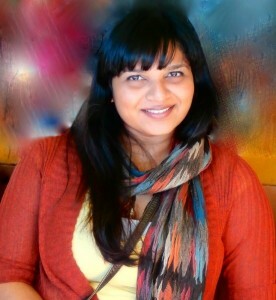 I am pretty much Priya. I was born in India and raised in Texas. I work in the medical field and am a nerd at heart (plaid, Battlestar Gallactica, ComicCon, all of that). I hate purses and shopping…and yes, I especially hate wearing high heels. So it was easy to pour out my heart and soul into Priya. Why the name Priya? It has nothing to do with my younger cousin with the same name. In my eyes, she’s still innocent and hasn’t discovered boys yet (she’s 22 and cute, guys, but let me have this one thing). I chose Priya (Pree-yah) because it’s simple, common, and most non-Indians have heard of the name. Think of Raj’s sister from The Big Bang Theory. Then along came Tyler…While he’s based off of my husband (eat your heart out, ladies), I was inspired to flesh him out as a fictional character after I read Grace Grows, by the fabulous Shelle Sumners. He’s a musician by hobby because I love music and music was a large influence on my moods when writing this book. Musicians for the playlist include Maroon 5, Neon Trees, and Usher. Why does Tyler work at NASA? Because one of my dream jobs is to work at NASA. Also, have your heard of Bobak Ferdowsi, AKA, the NASA mohawk guy? I love that mohawk! It only made sense that Tyler works at NASA! I mentioned I’m a nerd, right? Was there a lesson that I tried to squeeze into Priya in Heels? Diversity, culture, multi-racial love? Nope. That’s just what happened to me in real life and it’s just what happened to Priya. While I hope readers take away some insight into Indian culture and why choosing the love of your life isn’t so simple, I think this book is more about the love a woman has for her family, as well as her leading man. What about the game-changer? If you read the book, you’ll know what I’m referring to, that very sad catalyst. I won’t mention spoilers, but that game-changer was pulled from the rawest of my emotions. I literally cried so hard writing those scenes that I had to step away from the computer, and I hope that comes across to readers. In case you’re wondering, that part did not happen to me in real life. 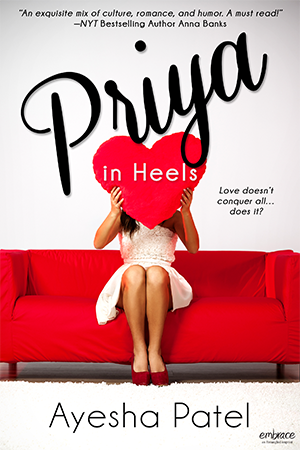 What was the point to writing Priya in Heels? I had a story I wanted to get out. More importantly, this was my way of expressing the depths of my love for my parents, who may never understand what I’m trying to tell them. Culture is important. It’s a beautiful thing. But love is unreasonable and we can’t choose who it leads us to. Sometimes it needs to bend tradition (which is not the same as rejecting our roots) to fulfill our happiness. And since we are the ones who have to deal with the person sleeping in our bed, we are the ones who need to make the right decision about who that person will be.